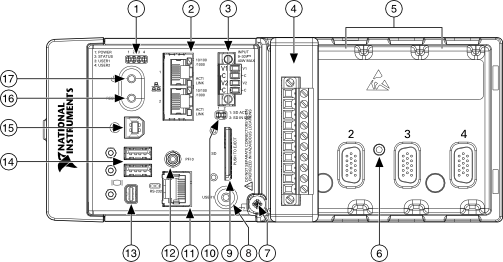 Programmable Function Interface—This terminal can be used to access a digital module in a single chassis. You can configure the PFI terminal as a timing input or timing output signal for AI, AO, DI, DO, or counter/timer functions. LINK Green Solid MXI-Express communication established. Yellow Solid MXI-Express communication broken or no cable is connected. POWER Green Solid The cDAQ controller is powered from the V1 input. Yellow Solid The cDAQ controller is powered from the V2 input. — Off The controller is not powered. DRIVE Yellow Solid An internal drive is being accessed. STATUS Yellow 1 flash every few seconds Software error—The controller is unconfigured. Use MAX to configure the controller. Refer to the Measurement & Automation Explorer Help for information about configuring the controller. 2 flashes every few seconds Software error—The controller has detected an error in its software. This usually occurs when an attempt to upgrade the software is interrupted. Refer to the Measurement & Automation Explorer Help for information about installing software on the controller. 3 flashes every few seconds Software error—The controller is in safe mode because the SAFE MODE DIP switch is in the ON position or there is no software installed on the controller. 4 flashes every few seconds Software error—The software has crashed twice without rebooting or cycling power between crashes. This usually occurs when the controller runs out of memory. Review your RT VI and check the memory usage. Modify the VI as necessary to solve the memory usage issue. Continuously flashing Software error—The controller has detected an unrecoverable error. Contact National Instruments. Continuously flashing or solid Software error—The device may be configured for DHCP but unable to get an IP address because of a problem with the DHCP server. Check the network connection and try again. If the problem persists, contact National Instruments. Red Continuously flashing Hardware error—An internal power supply has failed. Check front-panel I/O, CXM, and C Series module connections for shorts. Remove any shorts and power cycle the controller. If the problem persists, contact National Instruments. Solid Hardware error—The cDAQ controller internal temperature has exceeded a critical threshold. Ensure that the ambient operating temperature does not exceed the range specified in the Environmental section of the specifications document for your cDAQ controller. If the problem persists, contact National Instruments. USER1 Green/yellow — This LED is controlled directly from your LabVIEW RT application You can define the USER1 LED to meet the needs of your application. To define the LED, use the RT LEDs VI in LabVIEW. For more information about the RT LEDs VI, refer to the LabVIEW Help. 10/100/1000 Yellow Solid 1,000 Mbit/s data rate selected. Green Solid 100 Mbit/s data rate selected. — Off 10 Mbit/s data rate selected. ACT/LINK Green Solid LAN link established. — Off LAN link not established.